You are here: HomenextServicesnextPublic TransportnextA Mystery Solved? View of Rail Cottages showing the boardwalk crossing (note the Bridge parapet in the foreground) clearly showing the gates and warning signs. View of Railway Cottages showing the boardwalk crossing (note the Bridge parapet in the foreground) clearly showing the gates and warning signs. As the railway builders approached Laindon from the direction of East (later west) Horndon they had to build a number of bridges. The first of these was designed to take the track high over the Lower Dunton Road and the late Mrs Wright of Bowers Gifford who had been born at Doesgate Farm to the south, recalls, as a child, walking, with her sisters along the road to watch the work in progress. She spoke of the use of horses and carts that were used to move the spoil utilised to build up the embankment as it proceeded eastward. Much of this spoil must have come from the cutting dug into the high ground next to what was then Sumpner’s Farm. Thus was completed the construction of what has ever since been called the “Dunton Bank”. From Sumpner’s onwards, as it approached Laindon, the line ran through the cutting and a further three more bridges had then to be provided. As opposed to the road bridge at the Lower Dunton Road these bridges were, in railway parlance, all “occupation” bridges constructed especially to allow farm vehicles to cross from one side of the cutting to the other well above the level of the railway tracks. After any train running between London (Fenchurch Street) and Southend-on-Sea has breasted the Dunton Bank and then run through the cutting and passed under two of the three occupation bridges provided, it is commencing on a down hill run all the way to Pitsea and once under the third bridge the railway track eastwards is running on ground more or less level with the adjacent terrain. From this point onwards the track has reached the lands of what were once the fields of the Laindon farm of Little Gubbins. In the field just to the south of the old farmhouse and its yard was the site that had been chosen to build a station to be known as “Laindon” serving the parish of Laindon to its north and the village of Langdon Hills a mile to its south. The new station’s design was an almost exact duplication of that built at East Horndon, with its “down” or Southend bound platform accommodating the station buildings; a booking office and hall with an attached house for the stationmaster. On the “up” or London bound platform was to be a simple shelter for waiting passengers; the two platforms to be connected by a timber footbridge to be built for the benefit of the safety of intending passengers only. 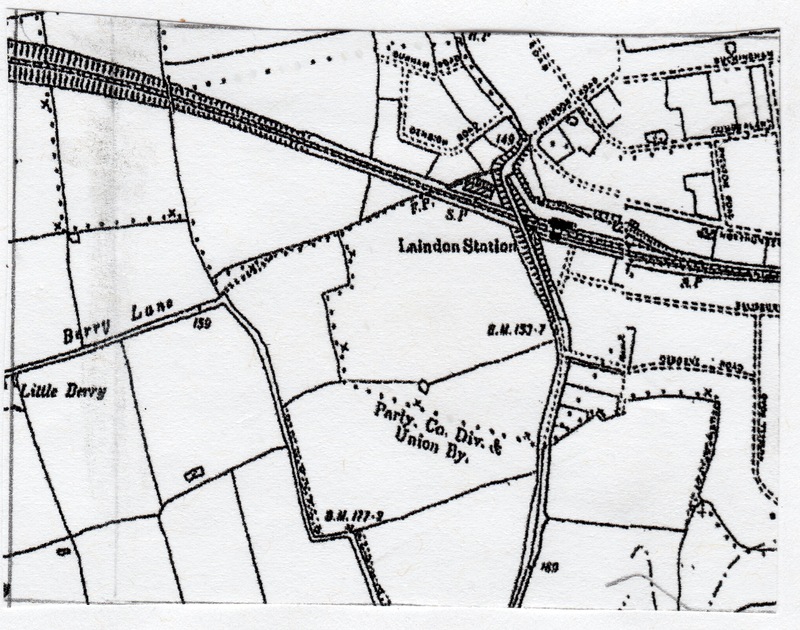 However, just before the tracks reached this planned new station, the railway builders were compelled to reach a decision about what to do about taking the tracks across the turnpike road that ran north to south between Billericay and Stanford-le-Hope via Laindon and Langdon Hills. 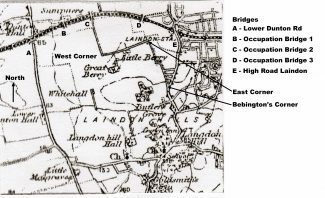 Should they build a road bridge as they appeared to have done across St. Mary’s Lane at East (West) Horndon, or should they be satisfied with just a “level crossing” such as those that already existed at Benfleet and Leigh further to the east? In the absence of any documentary evidence it is not clear what decision was reached at the time and local historians have been forced to speculate ever since mainly on the basis of the oft expressed vocal evidence of there being “a crossing at Laindon station”. What is known from the examination of both photographs and maps is that a bridge taking the road over the railway was built but at what stage in relation to the construction of the station is not clear since neither map nor available photos are very clear in their dates. The station was completed and opened in 1888 but the earliest date for a map so far found clearly indicating the presence of the bridge is 1898 and even this date may not be entirely reliable because in many areas often some alterations were only made on earlier editions of a map without any indication of that fact being provided. A recent re-reading of some earlier historical material, however, now offers a clue as to why a rumour should have grown up regarding the possibility of there once having been a railway level crossing at Laindon Station instead of the present High Road bridge. The “Laindon Advertiser” of April 1931 contains a report of a meeting of the Little Burstead Parish Council held on the 10th of March at the Carlton Club Hall which was then the name of the still existent Winston Club on the corner of Northumberland Avenue. At this meeting, the chairman a Mr. M Land, who was also the representative for the parish on the Billericay Rural District Council, giving an account of the work of the Parish Council in the preceding three years consequent on the council just having been re-elected, referred particularly to ”the kerbing of the High Road, the improvement of the paths, and surfacing the railway bridge; also the diversion of the footpath from Berry Lane and closing of the dangerous level crossing”. (My italics) It was this linking in the same breath, as it were, of “Berry Lane” and “level crossing” that gave the clue as it what it was that was the genesis of the rumour. A re-examination of the early map was most revealing on the subject. To understand, however, the historical changes wrought by time, it is necessary to return to a period before the arrival of the railway. Like the parish of Laindon, the parish of Langdon Hills was, despite the claim in early directories that “the village” lay a mile south of Laindon station, virtually without any centre. It was composed mainly of isolated farms interlinked by a few roads of which, apart from the turnpike road from Billericay to Stanford-le-Hope via the Crown Hotel, only what we now know as Old Church Hill to Dunton and Bulphan, Dry Street, “Oxford Street”, (now called Lee Chapel Lane), and Berry Lane were all that were indicated on maps. Clearly, in an area so large other paths would have existed for the convenience of the local population but as the development of cartography or map-making was not thought absolutely essential until the 19th century, such finer details like paths and buildings, particularly in rural areas, was an even later refinement. The thoroughfare that became known as “Berry Lane” was probably the most eccentric of any such in Essex. This can only be explained against the background of the area in which it is set and the detail of the developments that have, subsequently, wrought extensive change to that area. Initially, Berry Lane, it seems, provided some sort of a link between a number of farms, some large others small, except that, when the course that it followed is considered, it is as if it was designed to accommodate the ramblings of persons well taken in alcoholic beverages! For that reason, the form Berry Lane took is probably best described is from its southern end, that being closest to one of the very few public houses or inns in the district, namely the “Crown”. Berry Lane diverged westwards off High Road, Langdon Hills some 2/3rds of the way from the “Crown” travelling towards Laindon station. This was the point ever after known as “Bebington’s Corner” because Estate, Land Agent and Auctioneer H E Bebington erected one of his distinctive offices at the apex of the triangle that that divergence makes. 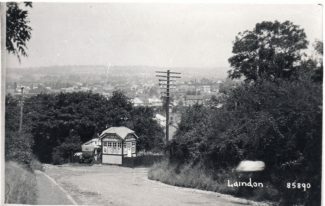 For years, picture postcards showing this office looking northwards towards the heights on which stands Billericay was the iconic view of Langdon Hills and Laindon that were despatched all over the world and still it appears in historical accounts of the district even though it, and the specific view, have long since disappeared. Both the office and Harry Bebington’s bungalow named “Primrose Lodge” next to it were demolished at the time of a re-routing of the High Road, the space they and other properties occupied are now occupied by what was the local community hall (recently acquired by the local branch of the British Legion as a new HQ) and the small “Triangle” shopping complex. 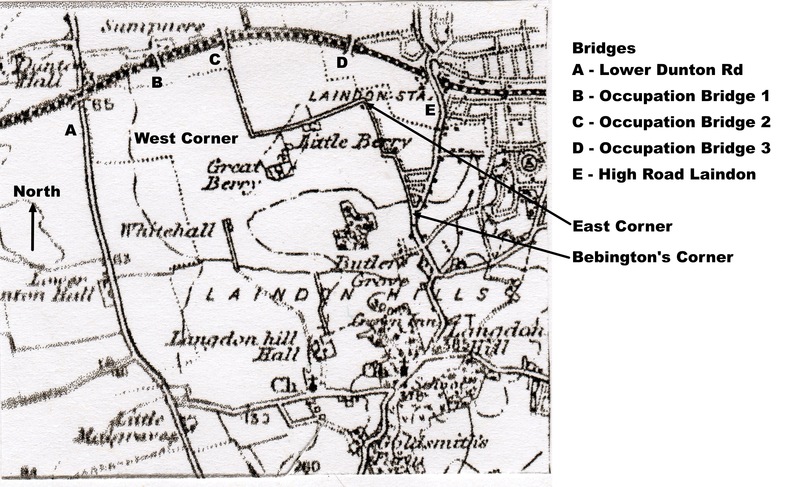 Assuming that High Road, Langdon Hills has always proceeded northward from “Bebington’s Corner” in a toughly straight line, from that point of divergence Berry Lane proceeded in an East of North East direction, slowly distancing itself from the High Road. Connecting the two roads at right angles from the High Road three local roads, St, Davids Road, Samuel Road and Vowler Road all of which still exist became progressively longer and longer as the gap between the High Road and Berry Lane increased, Vowler being the longest. Some two hundred or so hundred yards after passing its junction with Vowler Road, Berry Lane took a complete change of direction by turning through a full ninety degree angle to the left, a change of direction that has now been totally obscured and lost by redevelopment. As this is important to the story of the railway level crossing mystery it shall be referred to as the “east corner” because, as it will be revealed there was yet another complete change of direction made by Berry Lane that has yet to be described. At the “east corner”, any person travelling along Berry Lane would find that from proceeding in an East North East direction, having turned the corner, they would now be travelling in something of a South of South Westerly direction, such were the vagaries of this road. It is quite probable that there was a local name given for this distinctive corner but if there was, it is lost from the records. Although, on the ground, this was a change of direction for Berry Lane, in reality it was a meeting of four pathway, for it was possible to continue on in a straight line in the ENE direction along an un-made up road given the name of Bridge Road and in a short distance reach the third of the “occupation” bridge across the railway described in the second paragraph of this discourse. At right angles to this road, turning of to the East was another short, unmade up road given the name of Beatrice Road. Adjacent to this crossroads and fronting on to the North side of Berry Lane was one of those small corner shops (Lungley’s) with which the area proliferated before the re-development of the Basildon New Town destroyed the majority of them. In front of this shop was one of the few postal pillar-boxes of the district. After making the complete change of direction at the crossroads just described, Berry Lane continued on up hill in a more or less straight SSW direction towards Dunton, passing the entrance to the driveway to Great Berry Farm which, obviously, gave the lane its name. After passing this point, still retaining its identity as “Berry Lane”, there was another complete change of direction, once again through a ninety-degree angle, (“The West Corner”) as the result of which the road was restored to the original ENE direction, from which point the road ran forward to the second of the bridges described in the second paragraph of this missive. It was this second bridge provided for Sumpner’s Farm, which, when transposed to become the Dunton Caravan Park, that Deanna Walker describes in her book “Basildon Plotlands” (Phillimore & Co. Chichester, 2001) as the way her family used to reach their holiday home at “Halliford”, High Bank Drive, Dunton. They were compelled to use this particular bridge because the first of the three “occupational” bridges had long been demolished. It was the original layout at the “East Corner” that is of interest in the consideration of what was being referred to at the April 1931 Little Burstead Parish Council meeting concerning the “dangerous level crossing”. 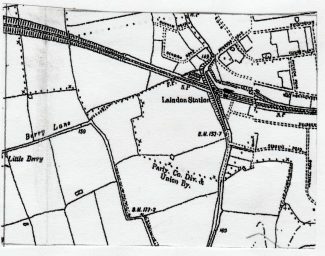 A look at the Ordnance Survey map of 1895 a drawn to a scale of 6 inches to the mile reveals that, in all probability, people walking from Berry Lane, particularly from the direction of both Little and Great Berry, to Little Gubbins would have chosen to follow a footpath from the “East Corner” of Berry Lane across the upon field at the corner and, after following the line of the adjacent hedge, strike across to what was to become the High Road and the drive leading to Little Gubbins. Such rural paths were frequently to be found in the area as the larger scale maps reveal, constant usage as short cuts being clearly visible on the ground. It would be apparent to the railway builders that such a path existed and where such a longstanding right of way existed, a board walk between the rails of the track would have been provided for the convenience of pedestrians. Without a doubt, notices, usually cast in metal, would have been posted each side of the track enjoining persons using the track to “Beware of Trains”. It becomes obvious from a further study of the map that, with the arrival of the railway, the most convenient route for pedestrian to be take to the station itself if they were coming from Berry Lane, was to follow the footpath from the East Corner, cross the line at the boardwalk crossing and then turn right to walk alongside the terrace of railway cottages that had been built at the west end of Laindon station. At the east end of these cottages, a flight of steps enabled the pedestrian to reach the level of High Road at the point where it was carried over the railway, a point immediately adjacent to the Station Approach on the other side of the road. Not surprisingly, the building plots being offered for sale adjacent to Berry Lane, particularly after that road was provided with a hard surface, proved to be popular and the population of that area, composed of permanent homes and “weekend” retreats, began to expand quite rapidly. Many of the occupiers of plots in the Dunton area found it useful to walk via the road called “Forest Glade” to the West Corner of Berry Lane, thence via the Lane itself to the station . This would mean that the boardwalk crossing to the west of Laindon station would be well used and, although no actual record has been found to support the presumption, it is not unreasonable to assume that compromises of the safety of pedestrians came under notice. These were likely to have been a combination of a series of “near misses” in which users of the boardwalk crossing were insufficiently diligent taking heed of approaching trains and, even more likely, those who, having been able to gain access to the railway track at the crossing, took it upon themselves to avoid the long trek to the London bound platform by the approved route, choosing instead to walk by the trackside and under the road bridge directly to the platform. The popularity of Laindon station as a destination for rural pursuits is well known and, indeed it was its, and Southend’s similar popularity as a leisure resort, at weekends and holidays that helped to make the LT&SR service so profitable. In 1912 the London Midland Railway bought the LT&SR and, with “grouping” it became part of the LMSR in 1923. This last change coincided with an increase in commuter traffic in South Essex and the ex-LTS part of the LMS was said to be the most valuable to the LMS as a whole. Accordingly, improvements were planned and introduced to the line. These improvements which included the building of new stations at Southend East and Chalkwell as well as the closure of old Leigh-on-Sea and replacing it with an expanded station to the west meant a considerable alteration at Laindon. Firstly, at Laindon the road bridge at High Road was widened and the approach ramp on the South side was considerably lengthened, necessitating a new approach to Salisbury Avenue and a small re-alignment of the High Road. The wider bridge enabled the permanent way to be increased to three tracks thus proving a “passing loop” within the confines of the station, an island platform being constructed to accommodate for this. Waiting rooms and toilets were provided on the upside (London bound) platform for the first time. These buildings were designed in a distinctive Art-Deco style by the architect of the LMSR of the day, and were similar to that provided in the same period (1933/34) at the new stations at both Chalkwell and Leigh-on-Sea. This revamp at Laindon has now been all swept away, a further example of just how little Laindon’s past is held in regard. The 1930s improvement to the layout of the station was designed to allow trains from London to be terminated at Laindon and restarted on a return journey without risk of delay to through train in either direction. But it was alterations that took place on the station’s periphery that are of greatest interest as far as the level crossing mystery are concerned. The most obvious of these changes was that made to the timber-constructed footbridge at the London end of the station platforms. Its use, originally intended for passengers only, was extended by the installation of a ramp giving pedestrian access to the pathway over the road bridge and, at the same time giving access at the other end to the roadway of the station approach, thus making the bridge available to ticket holders and non holders alike. At the same time, an additional flight of steps was created on the west side of the road bridge opposite, These additional steps led down to a new footpath (known to all and sundry as the “cinder path”) that was created immediately adjacent to the railway’s perimeter fence and running parallel to the track as far as the existing path between Berry Lane and the railway foot crossing. This new pathway and steps provided a viable alternative means of crossing the railway and the “dangerous” boardwalk crossing was closed off forever, Thus the inhabitants of the small estate (Beatrice, Raglan and Florence Roads and Bristow Crescent) that had grown up in the field that had once separated the East corner of Berry Lane from the railway crossing, were now able to reach Laindon High Road with comparative safety as was being acknowledged at the Parish Council meeting of April 1931. The construction of Mandeville Way as the principal link, via Laindon, between Dunton and the town centre of Basildon already referred to above has obliterated not only the link that was Berry Lane turning into Berry Lane and Great Berry Lane, but it has also obliterated the cinder path that led to the station. The sole remaining legacy of the changes made that erased the “dangerous” level crossing from the community’s memory is the flight of steps from Mandeville Way to the High Road as it crosses the road bridge adjacent to Laindon station. Alan, a VERY late comment on your notes above. I also spent many happy hours sitting on top of the green transformer box outside Langley’s. A bit of a challenge getting up there when you are small, but well worth it. And also an answer to the question posed by Ian Mott. There were more properties on Bridge Road than you remember, the bungalow next to Langley’s shop, was occupied be John Doust, his wife Audrey and two daughters. His wife was the daughter of Mr and Mrs. Lungly (interestingly he was a jovial chap, unlike his ferocious sister who was for a while a teacher at Langdon Hills Primary and lived in a white painted wooden bungalow on the northen side of Alexandra Road, junction with high road near to the school). Next along Bridge Road on the left, was the bungalow of Mr. and Mrs Johnson and son William (my mate Bill), next to the Johnson’s and completely hidden by the bushes was another bungalow with a couple whose name I have forgotten but the wife’s maiden name was ‘Westfield’. Further on, the very big house shown in the distance in the top photo, it was a pair of semis, very big, Victorian style, the left side house was occupied by Mr. and Mrs Westfield, the parents of the lady in the next door bungalow. The right hand side of the semi was at one time occupied. I remember a brother and sister a bit younger than me living there, but they left after a few years and from then on that side of the house became derelict. One interesting fact about Mr Westfield; he had an artificial leg and walked to and from the station every day until retirement. He worked in London, and was always dressed immaculately, and I was told that he had fought in the Boar War. His wife was lovely and spoiled us kids something rotten. Further on and not in Bridge Road but in Sylvan Road, the plot of old Bondy. I passed it regularly on my way to school when it was dry enough to use the paths, and my recollection of his garden was that it was usually well maintained and must have have provided him with plenty of his vegetables, (well fertilised in the Chinese fashion). Interestingly he was not always so unsociable as you recollect, he would visit the very small grocery shop along Berry Lane just to the south of the junction with the now famous ‘Vowler Road’. I think that he went there weekly and I can recall being in the shop at the same time on one occasion (just room for two in that shop) and he was conversing quite normally with the lady shopkeeper. Then on to the bridge, a favourite playground for us kids, waving at the train drivers, standing on the bridge, leaning over the parapet when a train went past, getting steamed and smoked, then rushing to the other side. Walking along the parapet when feeling brave (silly I know) and as I have read somewhere before, putting pennies on the line before a train came along, to get them flattened. But until I discovered this site I never heard it called ‘Tom Thumb’s Bridge’. It was always Durham Road Bridge to everyone I knew. Gloria’s memory is amazing, I am a couple of years older but the mention the old crossing and allotments by the side of Beatrice Road is right at the ragged end of my memory, but I do have the memory of a goldfish. Mention of Stanley Villa incites me to write. My grandad and family lived there approx hundred years ago, he was Walter Arber, a printer who had a business in Roman Road, Bow, E3. If anyone knows of him, or details of his occupation of Stanley Villa, or photographs etc, please contact me. Alan. Florence Road and Emanuel Road were also named after Isaac Levy’s children. I will continue researching the origin of the name ‘Vowler’ as it’s so intriguing. Did you know about Harry Foulger, the other very successful builder in the area. He built many of the large houses on the east side of the High Road, Langdon Hills. Also ‘The Hiawatha’ previously known as ‘Greenhaugh’ and some of the houses with spires in the High Road, Laindon, on the north side of the A127. Spires seem to have been his style. Alan. I like your way of thinking but must point out that I have no proof that Frederick Ager built or named Vowler Road himself. I am trying to establish whether it was already there when he moved into the area shortly after 1901. It may well have existed previously as an unmade road that had been named earlier. Maybe it was improved to a superior quality to attract buyers after he began building large substantial houses in the road. This is something I will keep working on. I have however traced his probate record. By the time of his death on 13th March 1930 he was living in “Leanda”, Norsey Road, Billericay. Probate was granted to his widow Frances Emily Ager, his son Edwin Stanley Ager (a builder) and George Stanley Knott (a solicitor’s clerk.). Effects were substantial. Nina, point taken! You are, of course, correct in saying that there is no proof that Frederick Ager built or named Vowler Road himself. (Incidentally my apologies for mis-spelling Ager not once but five times in my previous posting.) However we do know, thanks to your research, that the builder Isaac Levy named the adjacent roads of Samuel Road, St David’s Road and Alexander Road as he built there. So, while not proof, there is a consistent pattern in Frederick Ager building and naming the road is there not? Editor: sorry I should also have spotted the error, now corrected. Why did Frederick Ager name his street Vowler Road? It is a perplexing question but perhaps the following rather convoluted supposition might stir a few thoughts. Frederick’s father was an agricultural worker. It was an era of extremely limited education and many people were illiterate. Official records often contained error and omissions.Some names were simply indicative of where one lived. Jim Hill or Bill Townsend. Some were indicative of one’s trade. Jim Miller or Bill Smith. Frederick’s given surname, Ager, was at that time a synonym for acre or agricultural worker. So perhaps the name Ager is simply another descriptive catch-all word for the various jobs performed on a farm. Frederick did not marry until he was twenty two years of age. Until that time he presumably lived and worked, as an agricultural worker of some description, with his family on College Farm, Little Totten in rural Essex. Fast forward to the point where Frederick Ager is a successful builder in Langdon Hills and has named the street which he built and where he lives Vowler Road. Why Vowler? It is possible, perhaps, that Frederick’s specific job within the catch-all agricultural designation was in fact that of a fowler. Among the alternative derivations and synonyms for fowler is vowler. Was Frederick Ager simply referring to himself (a fowler or vowler) when he named the street that he built? Miss Marple to the rescue! Well done Miss Marple! Another mystery put to bed. Nina, upon reflection I am puzzled by the fact that individuals such as Isaac Levy and Frederick Ager, coming from very ordinary backgrounds, with nothing but manual labour in their work experience, could end up buying land, building not just one but several houses, and perhaps putting in roads (ie Vowler). Where did they get the financing? Which responsible banker would approve a loan of the necessary magnitude to undertake such construction projects. They do not appear, personally, to have the building, surveying, or architectural skills to convince any banker to loan them money. Similarly, I cannot envision well heeled private individuals backing them with their own money. It was, in any case, an era of grinding poverty. No speculative money existed that would be attracted by building on a bunch of farms in a rural area of Essex. True the railway had arrived but there was no promise of government money to build even the most basic infrastructure. So where did these obviously driven and capable individuals get their financial backing. How successful were they long term? Was it boom and bust? Did their presumed lack of formal business expertise eventually cause them to over reach, make poor business decisions, get mired in larger economic depressions? Or did they make cautious and sensible long term decisions leading to a steady accumulation of money, a good life style, and eventual death leaving substantial sums to the heirs. One can only hope so. Editor: Alan in other articles on the site it is evident that the expansion of the railways encouraged many small builders to use money they had made elsewhere to speculate in building in the new evolving communities. Some were successful others fell by the wayside, just as they do today. The photo from the Bridge has resulted in an enormous mass of information, which appeared to suggest this was a foot crossing for pedestrians yet I feel the mystery has not been entirely solved as in the photo the gates appear to be much bigger than the normal foot crossing wicket gates. Also on the northern side there appears to be a structure which seems to be a height restriction for vehicular traffic, (although I am at a loss to explain the need in pre-electrification days). This would appear to have been an occupational crossing in which case the gates should have ben kept locked with the keys issued to a specific person who should advise the signalman of intended usage and close and lock the gates after use. This was usually the landowner(s) on either side of the crossing. I have sharpened the photograph and if you click on the image you can see a larger version. A close examination of the enhanced image indicates that the gates were in fact pedestrian and it appears that there is a shed adjacent to the gate on the northern side of the line on the London side of the gate, possibly associated with the use of the siding. In enhancing I have noted that there is a large house on the southern side of the railway somewhere near Berry Lane. Any suggestions? 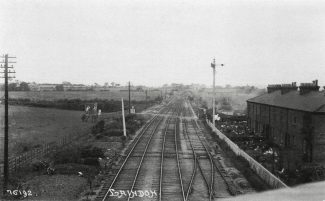 In the fifth paragraph below the photograph showing the railway lines, the parallel running cinder track, and Railway Cottages, John mentions three roads connecting the High Road and Berry Lane. St David’s Road, Samuel Road, and Vowler Road, There was, in fact, a fourth road, Alexander Road. This was the first of the four roads, running just below and north of Bebington’s corner and opposite Langdon Hills school. Alexander Road and St David’s Roads were not paved and had simple cinder tracks along one side of the road only. Samuel Road was macadamized and I can remember a hard surface footpath on one side of the road. 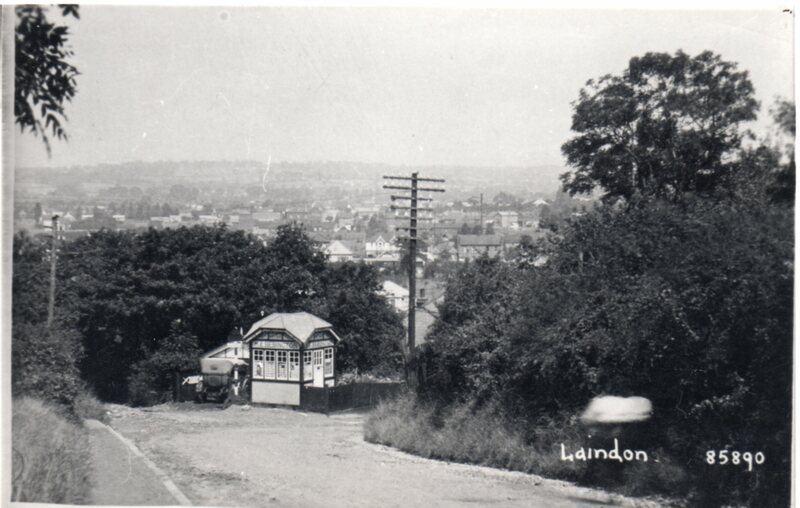 Vowler Road was a very up market street for Laindon. Perhaps unique at that time. The road was concrete with a macadamized footpath on each side of the road with a narrow grass plot separating the path from the kerb of the road. It also boasted storm drains on both sides of the road for its entire length. Why its construction was so superior (and expensive) compared to its neighbours is a mystery. Alan. It’s possible that the road’s quality had something to do with the fact that the builder Frederick Ager lived (and built) there shortly after the start of 1900. Frederick Ager lived in “Ingleside”, Vowler Road and built most of the large houses there. A little of his history: Frederick Ager was born in Tollesbury, Essex in 1860. His father was an agricultural worker (Farm Bailiff, College Farm, Little Totten 1871 Census). Frederick married Hannah London in 1882 in Romford. In 1891, they were living at 5 Oxford Street, Barking with their children, William age 6, Frederick age 5, Emily age 3. Frank age 2 and Eva age 2 months. Hannah died in 1895. Frederick then described as a “Merchant Tailor”. The following year 1896, Frederick married Frances Emily Perry, in Romford. In 1901 the family were living at 90 St Ann Road, Barking with their children, Frederick age 15, Emily age 13, Frank age 12, Eva age 10, Alexander age 6 and Edwin age 11 months. Frederick described as working at a ‘glassworks’. In 1911 Census shows the family living in “Ingleside” Vowler Road, with children Edwin Stanley age 10, Hilda age 6 and Norman age 2. Frederick now described as “Builder”. He named the houses he built in the road after his children. Stanley Villa, Norman Villa, (both still standing) Hilda Villa, Eva Villa. He possibly also built “Courtfield” the large 1906 house which still stands towards the east end of the road, not far from the High Road, but this isn’t confirmed as yet. He died in 1930. Still outstanding is the reason why the road was named “Vowler”. After much research, we still haven’t come up with the answer. Nina, the name Ager rings a bell. There was an Ager family living on the east side of Berry Lane between Alexander Road and St David’s Road. Or perhaps it was round the corner in Alexander Road itself. It is surmise on my part but not unreasonable to assume that some of Frederick Ager’s descendants settled in the immediate area. There was a son, Malcolm Ager, who took great joy in fairly regularly beating up my younger brother on the way to or from Langdon Hills school. I finally had to straighten him out!! Alan. It appears that you could be spot on. Frederick Ager’s son Norman who was born in 1909, married Florence Arding in 1925. (It seems he was only 16 and she 17). Norman and Florence had three children: Clifford 1928, Margaret 1932 and Malcolm 1935. The 1951 Electoral Register shows Norman, Florence and Clifford living in “Albmar”, Alexander Road. (Margaret and Malcolm weren’t listed as they were below voting age). I’m glad you taught Malcolm a lesson. Woe betide anybody who messed with our little brothers (I had one of those too, five years younger than me). An extremely interesting and informative article. It had escaped my attention until the present. I lived in Raglan Road as a young lad and was very familiar with the area. Perhaps I might add a few very minor points. 1. 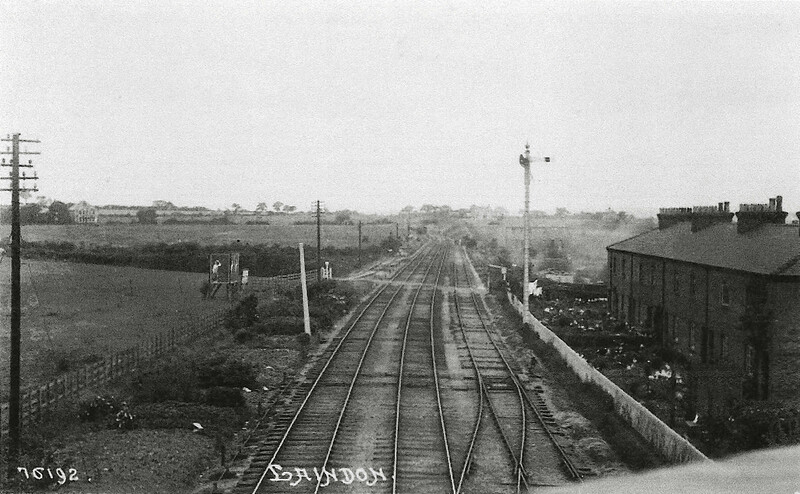 The first photograph shows the railway lines, cottages, and the cinder track on the opposite side which ran parallel to the railway lines. The footpath was indeed referred to as the cinder track but I am uncertain where it became Beatrice Road. Did Beatrice Road commence when the cinder track did a ninety degree left turn upon reaching the white gate/turnstile which signified the entrance to the earlier existing boardwalk? Or did Beatrice Road not commence until some point closer to Berry Lane? Perhaps at the small stream which ran across the road? If it was still the cinder track after taking the ninety degree left turn then was the same railway improvement responsible for erecting the small wooden footbridge over the stream? On the other hand, before the advent of the railway, did Beatrice Road, as a right of way, run all the way across what became the boardwalk and on further north beyond what became Railway Cottages? 2. Lungley was indeed the name of the proprietor of the shop at the junction of Berry Lane, Beatrice Road, and Bridge Road. Prior to Lungley it was Townsend. Regardless, it was always referred to as the corner shop by local residents. 3. Regarding the occupation bridge, further north on Bridge Street, marked D on the third photograph. This was always referred to as Tom Thumb bridge by local residents. A lad could climb down the embankment, place a penny on the railway line, retire, and wait patiently for the next train. After the train had thundered through the penny would be exactly where it was placed with its radius increased by about 50% and was slightly concave. Or convex if one turned it over! I cannot remember trying to pass the penny off in a store but I doubt that it would have been accepted as legal tender. 4. Walking from the corner store there were only two bungalows on Bridge Street, both on the left. Directly behind the corner shop was a heavily treed bungalow. Poplar across the front and surrounded by hawthorn. Who lived there I have no idea. I cannot remember ever seeing anybody there. Further up, closer to Tom Thumb bridge, in a rough, unkempt clearing between the inevitable hawthorn was situated a windowless, wooden bungalow on cinder block. More of a large shed really. No sign of a garden. No sign of electricity lines running to the bungalow. Not even any sign of the nigh universal outside sanitary facilities! Therein lived Old Bondy. Old Bondy was not a tramp for he had a residence, however humble. He appeared fearsome to us young lads. A big, burly, middle aged man. Obviously a loner he always carried a bundle on his back. Torn and dirty clothing and worn cloth cap with a firm, purposeful walk, never saying a word to anyone but answering with a threat if anyone dared to talk to him. The sight of him terrified us young lads. If one saw him approaching, the quick response was to cross over the street or to take a swift detour down another street. Any street! 5. John makes mention of the post box outside the corner shop. One of the very few in the area. Within a few feet of the post box, situated on a concrete slab, rested a large green, totally enclosed, metal case. Probably two feet by four feet and four feet high. A slight hum emanated from it constantly. It must have been associated with the local electrical supply in some way. It was always warm and it was pleasant to climb upon the green metal box and feel the warmth (since one abiding memory I have is of being cold almost all of the time). 6. My mother would allow us to go part way to meet my father as he returned from Laindon by train. We were not allowed to go any further than where the old boardwalk gate/turnstile still stood and where the cinder track made a ninety degree right turn. It was much overgrown by this time but the distinctively tall and white gate still remained. At the time I never realized what it was nor would I have been interested. In his history of the railway around Laindon Station, John remarks upon its usage for those seeking rural pursuits. The photo taken from the bridge does give an insight as to how the railway was an essential part of Laindon’s commercial life. by showing the extensive down siding alongside the cottages used to accommodate goods traffic waiting to access the also fairly extensive goods yard or empty wagons awaiting removal. There was also a similar up siding situated to the east of the station , this was almost completely removed by an unscheduled and unforeseen occurrence. One weekend an engineers train was placed there awaiting path and it seems a chain dropped and hooked on to the rail. The train then took off and on entering the station was found to be trailing a large portion of the up siding. The siding was never restored to its original length. The crossing you are refering to at the railway cottages was a boardwalk to take the residents of the cottages to their allottments on the other side of the railway. My grandfather moved into No 1 when they were finished and my dad took over No 1 when they both passed on in 1942. There were 8 allotments, on one side there was a big hedge. The other side of the hedge was the path that took you from the station to Berry Lane. Mr Monk lived in the end cottage in the picture with the tall hedge. I lived at No 1. A very interesting read John and from an area of Laindon I know very well. We would walk from what we called ‘The Back Path’ from King Edward Road, to the bridge labeled “D” on the map, it was a lovely cobbled stone bridge. I wonder if the stones were local? It was all lumpy and bumpy with so much character, we would go straight across into Bridge Road walk down to what is called the East corner of Berry Lane turn left into Betrice Road to my grandparents house, where I was born. Or we could turn left across the bridge and along a little grass track to the junction with Raglan Road and Betrice Road to get to my grannies. Another way was to turn left down the Cinder Path across a little stream (a small bridge had been built across it) to the huge white station steps, which on reading the above article I think are still there. A family story has it that my mother in her teens hid under these steps during an air raid. I can remember from about 1945 going along this path and can recall the remnants of a crossing but by then a high wire fence had been put up so you could not gain access to it. The allotments were along there between the wire fence and the railway line but I can’t recall how access was gained to them. Editor: The steps were removed when a new dual carriage road (Mandeville Way) was built just south of the railway line.